Does your organization do projects well? Are your projects finishing on time and on schedule? Do your projects deliver the expected benefits? Does a change in the project generally result in the project continuing on while the change is dealt with? Is project management something for which you have a well-defined approach? If you answered "no" to more than two of the previous questions, then you may want to perform a project management maturity self-assessment. For the purposes of this article, we define project management maturity as: the progressive level of acceptance and implementation of project management as a business practice. All organizations have a PM maturity level. Some organizations have low maturity, meaning that projects are not well planned, executed, or completed. Other organizations have a high level of maturity, which means they have a defined process for performing project management, see it as one of the key ways to meet strategic objectives, projects are well planned, executed and closed. Most organizations that do projects will fall somewhere in between the two extremes. What are PM maturity levels? There are a number of maturity models in the mainstream (over 20 of them). Some are industry-specific while others are more generic. For example, the software industry primarily uses the Capability Maturity Model Integration (CMMI®). This model was developed by the Software Engineering Institute at Carnegie Mellon University. A more generic model that can be applied across a wide swath of industries is the Organizational Project Management Maturity Model (OPM3®) by the Project Management Institute (PMI)®. A comparison of these two models can be found on the table below. Depending on the model used, there are varying degrees of confidence in the outcomes of the assessment methods, various amounts of resources required to conduct the assessment, and in certain cases, firm requirements for the person leading the assessment. How do you know where your organization is located on the PM maturity spectrum? There are many consultants out there that will charge many thousands of dollars to perform an assessment for your company. From that assessment they will make recommendations of how you get from where you are - to where you think you want to be. These recommendations can range from very easy and cost effective ways to the very expensive, time consuming changes that organizations avoid simply because it's a totally new way of doing things. There are self-assessment tools available on the internet which could be used, but there are caveats to using these. The assessment may be poorly written, it may use queries only for specific industries, it may not provide an analysis of the answers, it could give a misinterpreted assessment, the assessment may not be administered properly, and a host of other issues. Additionally, there is no one on the other side explaining what your organization should do next. What impact does the level of PM maturity have on projects? Several studies are available that show a clear link between the level of PM maturity and project success. In general, between the lowest level of maturity to the highest level of maturity, an increase as much as a 50% in project success can take place. 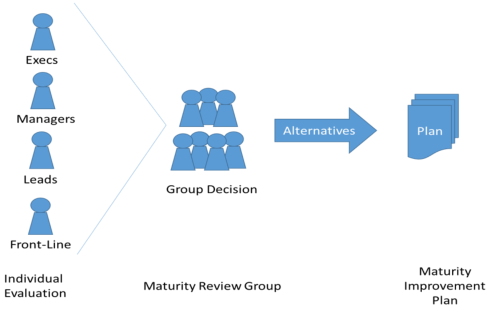 How is a PM maturity assessment conducted? There are three basic approaches to performing an assessment - Top-down, Three-sixty (360) and Bottom-up. With the right methodology, any one of these approaches can be conducted by either a third party or as a self-assessment. A top-down approach starts with senior management assessing their own understanding and knowledge of project management and it results in identifying a level of maturity - at the leadership level. In this approach, a questionnaire is completed and scored against a simple scoring system. The advantage of the top-down methodology is simple: operational directives flow from top-down; therefore, to increase the PM maturity, the driving initiative to increase that maturity, at the lower levels of the organization, needs to start from the top. A 360 assessment is sometimes called a 360-degree assessment, because it means that everyone involved will assess everyone else, from a project management perspective. This entails probing questions at various levels of the organization, assessing how well PM is treated/conducted at all levels. A comparison of the responses is made to ensure there is no disconnect between varying levels of those that implement/work on projects. The number of assessment questions can range from less than 100 to more than 800. Some assessments require a third party to conduct, while others can be a self-assessment. With the self-assessments, a companion book or website is used to interpret results and provides a generalized set of responses based on a scoring system. With the two approaches mentioned earlier, CMMI® is a self-assessment, has less than 200 questions and does not require a third party. Conversely, OPM3® requires a third party to administer and has more than 800 questions. A bottom-up approach rarely produces an increase in maturity. Some employees call this "the flavor of the month". This means an initiative is being mandated by senior management, but they are not truly behind the change. For example, there may be a few training sessions, some buzzwords and catchphrases are bandied about, but when it comes to actually following through and changing processes, senior management says, "this isn't really what we thought it was..." and they give up on it. What do you do with the information from the assessment? The maturity improvement plan will outline those specific actions the organization needs to take to increase the PM maturity level. These actions can be dramatic and sweeping, such as spending a year developing PM practices, training personnel and locating tools to help PMs do their jobs. The actions can also be simple, such as a policy to hire certified PMPs. However, there is one element, mentioned across the spectrum, regarding any actions taken to improve PM maturity: the best approach is to take consistent, small steps towards improving maturity, rather than huge and complicated steps. What is the benefit of knowing your organization's PM Maturity? If you don't know what the problem is, you will spend time, effort, resources, and money on fixing symptoms rather than the root-cause. At the most basic level, knowing the current PM maturity helps identify a starting point (let's call this Point A). Using the organization's strategic vision as the end point (let's call this Point B), you can determine the path to get from point A to point B. Naturally, this can be a long, drawn-out and difficult process and may require outside help. There is yet another benefit. If you struggle with understanding why things happen the way they do (and usually not for the best), being aware of the maturity level can benefit the PMs so they can plan for these issues ahead of time.